Tue., Jan. 22, 2019, 11:20 a.m.
SOUTH BEND, Ind. – Boston College found out quickly what it is like to deal with No. 1 Notre Dame’s Brianna Turner and Jessica Shepard. On the opening tip, the 6-foot-3 Turner batted the ball to the 6-foot-4 Shepard, who turned, dribbled a few times and scored an easy layup. A little more than a minute later, Shepard returned the favor, her pass finding the quick-cutting Turner for another easy bucket against the Eagles, who became the 11th straight team to lose to the defending NCAA champions. “They score points in a hurry,” Boston College coach Joanna Bernabei-McNamee said. 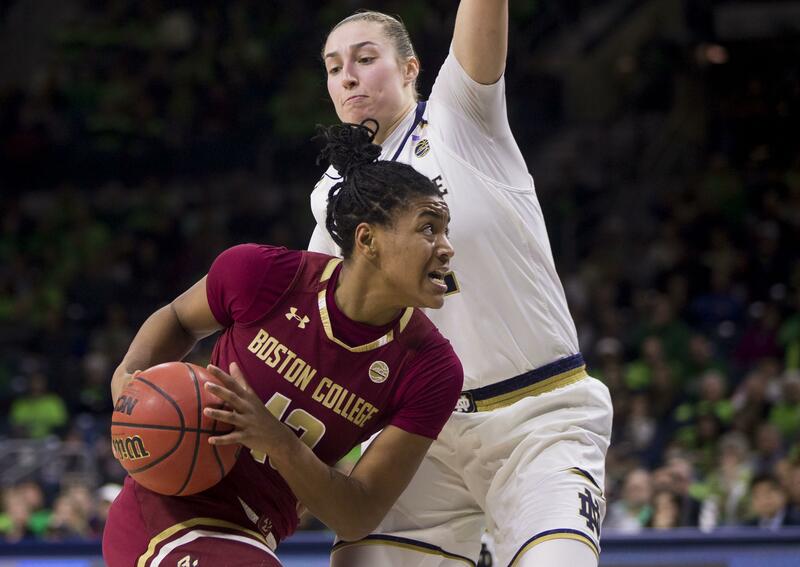 If having to slow down guards Arike Ogunbowale, Marina Mabrey and Jackie Young on the Fighting Irish fast break is hard enough, try doing it with the dynamic duo of forwards Shepard and Turner starting it. That is the task ahead for unranked Tennessee (12-6), which takes a five-game losing streak into Thursday night’s home game against Notre Dame (18-1). When the teams met a year ago in South Bend, Notre Dame rallied from 23 points down in the first half to win 84-70, the largest comeback in Irish history. This season, Notre Dame averages an NCAA third-best 87.8 points a game with its five starters all in double figures, led by Ogunbowale’s 21.5 points a game. Shepard averages 14.9 points with 9.2 rebounds and 3.2 assists while Turner averages 13 points along with 7.7 rebounds, 1.4 assists and 2.3 blocks. They have combined for 11 double-doubles (six by Shepard) this season. Turner and Shepard also share one more thing: ACL injuries that required knee surgery. Shepard’s came during her senior year at Fremont (Neb.) High before she moved on to become an all-Big Ten performer at Nebraska and then transferring to Notre Dame. An NCAA waiver made Shepard immediately eligible for last season’s championship run that was accomplished without Turner, who sat in street clothes throughout it after a torn ACL ended her 2016-17 campaign. “Any time someone goes through a major injury like that, it wears on you mentally,” said Shepard, who got to know Turner, an immediate impact player at Notre Dame after playing for Manvel High School in Texas, in summer travel competition. Their friendship grew last season when Notre Dame overcame season-ending ACL injuries to Turner, Mychal Johnson, Mikayla Vaughn and Lili Thompson to win the title. Ogunbowale’s second straight buzzer-beater in the Final Four wouldn’t have happened without Shepard, who had 19 points on 8-of-10 shooting and six rebounds. Turner received a championship ring for her cheerleading on the bench and would like another earned on the court. She’s become an even bigger admirer of her teammate since Shepard dropped 40 pounds the last couple of months. Shepard and Turner are having fun finally playing together. Their opponents, not so much. “You have to pick you poison a little bit,” Wake Forest coach Jen Hoover said after a 78-48 loss at Notre Dame last week when Turner had 14 points, 12 rebounds, two assists and two steals in 23 minutes and Shepard added 16 points, six rebounds, five assists and four steals in 18 minutes. Coach Muffet McGraw chuckled at the comment but realizes her good fortune. The Irish have averaged 21.9 assists on 33.5 field goals during the winning streak that began after a blowout loss at home to Connecticut on Dec. 2. During the streak, Notre Dame is averaging 42.5 rebounds – 9.9 per game better than their opponents. Turner and Shepard are doing that work – and then getting out on the break after often starting it with an outlet pass. Published: Jan. 22, 2019, 11:20 a.m.